Sean Davidson serves as a Senior Sales Consultant with Mark Spain Real Estate. He was born and raised in a close-knit community in Marietta, GA and attended Harrison High School. Sean received his Bachelor of Business Management from the University of Georgia in 2015. Upon graduation, Sean joined Mark Spain Real Estate as a Listing Consultant and now serves as a Senior Sales Consultant. This past April, Sean Davidson became the first ever agent to reach 100 closings with Mark Spain Real Estate. Sean is a champion of the Mark Spain Real Estate culture and we are so thankful to have him as a part of our team. We are excited to spotlight Sean as our next Human of MSRE! Prior to graduation, I anticipated doing business in Atlanta working a typical 9-5 job. Luckily, at the final UGA Career Fair, I met our president John Makarewicz. We spoke about the MSRE team and experience I could be exposed to; it grabbed my attention immediately. After meeting with John, the other roles I was looking into in Atlanta seemed uninteresting and just fell by the wayside. I put all my energy into real estate and never looked back. The rest was history. It has been amazing seeing the team grow from less than 10 agents to now over 150. I’ve been with Mark Spain since we worked with Keller Williams through going independent in 2016 and now through all our expansion offices. Over the past 3 years of working with Mark Spain Real Estate, the people and the growth is what has excelled me to grow to where I am now. I like being able to make my own schedule and work as hard as I want, but the people here are truly second to none. 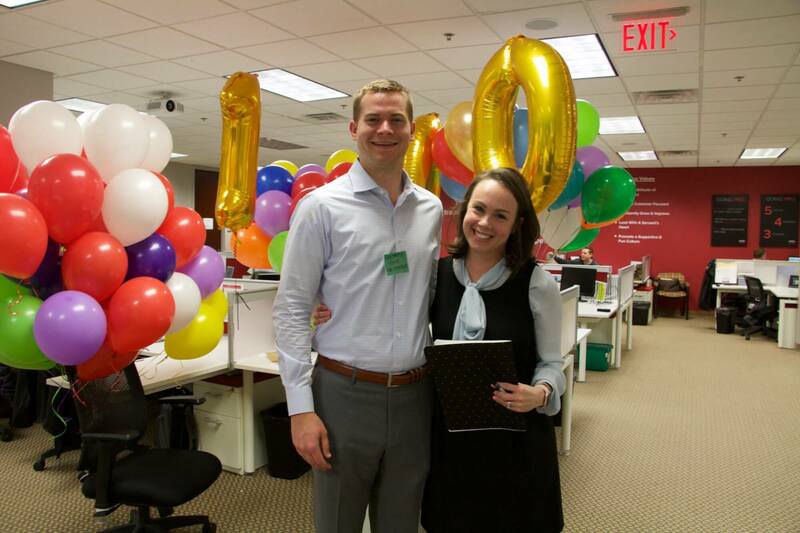 How did it feel to reach 100 closings with MSRE? Ever since I started, reaching 100 closings has been a major goal of mine. Finally hitting it was amazing. At times it seemed as if I would never get there, especially when I was just learning the industry, but I continued to grind it out and was honored to be the first to accomplish that goal with the company. After helping 100 families, what stands out the most? I have worked with fantastic people along the way and learned valuable lessons that have influenced me greatly. We are in the people business, and I have had the pleasure of not only helping people accomplish their goals but also being shaped into who I am today along the way. When I look back at the 100 families I worked with over the past few years, the situations that stand out most are those where we are able to really, really help people. Maybe they are in a bad financial situation and need to sell. Maybe it’s a couple that needs to move before they have a new baby. Or maybe they are first time homebuyers. Those closings are always so fun and special; they bring the whole family and it’s awesome to be a part of it. What is most special about the culture at MSRE? The people. Plain and simple, we have some of the best people around that have created an environment of encouragement, discipline, integrity, enjoyment and class. I could go on and on. ‘Work hard, play hard’ is a phrase that gets tossed around. Investing in your business is a priority, but we realize that there needs to be a work-life balance involved as well. We spend a lot of time with these people, so we might as well make it enjoyable. In fact, we have started our softball team back up, The Closers will be taking the field in the Fall! Tell us about the friendships you’ve made at MSRE? I have made lifelong friends while working here. We not only spend a lot of time together in the office but also outside of work. Whether it’s a Braves game, happy hour, golf outing, wedding or an Atlanta United game, we find ways to get together. Our significant others and spouses have become friends as well, it really is just a big family! What do you admire most about the leadership team at MSRE? Our leadership team is excellent. They push us to be better, not only in business but on a personal level as well. They care about our goals and are there to support us as we work to achieve them. Our team really wants us to live a big life! Personal development is a huge part of growth so they make a point to find out what we are reading and how we are getting better. I barely went to the gym until I got here. Habits like getting up early and going to the gym, just having a morning ritual in general, all started with Mark Spain Real Estate. I find my morning ritual now is very important to me and affects my whole day. I have always enjoyed sports so I make time for those. I play basketball and golf as regularly as I can make time for. My girlfriend is a former collegiate volleyball player so that is another one that I have been trying to pick up; she’s been patient with me as I get up to speed! Georgia football in the fall is always on my mind. Last year was incredible, and I was fortunate enough to make it out to Pasadena for the Rose Bowl, which was an unforgettable experience. Go Dawgs! My mom. She is an amazing woman who did whatever she had to do to give my brothers and I the life she thought we deserved. Working long hours while also putting herself back through school and still finding time to spend with us and spoil us, those are times I’ll never forget. I still don’t know how she did it raising 3 boys but it definitely taught me to push and work for what you want. It may sound boring, but I’m most looking forward to continuing to push myself and grow as a person. I look at who I want to be in 10 years and know that I have to instill those habits now in order to get there. Baby steps every day compound. I have big goals, and I know it will take time to get there. For me, this quote means you can sit back and wait around and maybe good things will happen but ultimately you have to take your unfair share and go out and get it. Italy. I grew up going there a lot as a kid. We were there eight weeks during the summer as well as Thanksgiving and Christmas break. We also traveled a lot on the weekend, which allowed us to see a lot of cities. Lucca, Italy is one that stood out as my favorite. I’d also love to get out to see the East Coast of Italy. I’m a sucker for a classic, good cheeseburger. My favorite place to eat out is Chipotle, though; I could eat it every day.